Would you like to take part in the best adventures of your life? Then this game is for you! 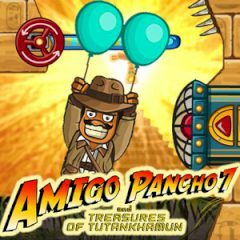 Could you believe that our mexican friend Amigo Pancho has gone to Egypt, and is collecting relics in pyramids! It is so exciting! Just make your way through the puzzles as you search for the treasures of Tutankhamen, and watch out for traps. There are a lo of them, so just have faith in yourself and set the best record. Are you able to help him? Then just go ahead and play the game. Enjoy it and be sure that you will love this game.